Using a knife, cut around the pit of the avocado, separating the halves from each other. Remove the pit and use a spoon to scoop out the avocado. In a large bowl, combine the avocado, onion, tomato, cilantro, salt, and lime juice. Mash and stir with a fork until there are no large chunks of avocado left. Season chicken breasts with salt and pepper on all sides. 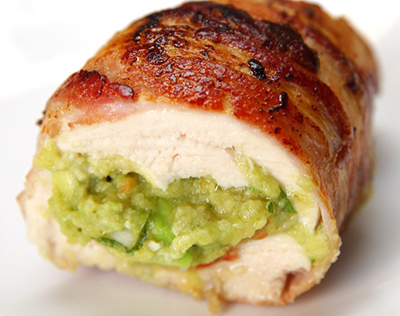 Slice chicken breasts in half crosswise. Cut a slit into the center of each half to make a pocket. Take a heaping spoonful of the guacamole and pack it into the pocket. Pinch the edges of the chicken closed. Wrap the chicken with two strips of bacon, making sure the ends of the bacon all end up on the same side of the chicken. Heat oil in a pan over high heat. Sear the bacon-wrapped chicken for two to three minutes on each side. Remember to cook the sides of the chicken as well. Bake for 10 minutes. Serve!